It’s been a long time coming, but I have finally got around to reviewing Permission To Kill. You’d think it would be the first film off my bat, but alas, it has taken me a while to scribble down my thoughts on this film. And it’s a film that gets very mixed reviews elsewhere. It seems to be a film that you either love or hate. I hate to be a fence-sitter, but I am in the middle. It isn’t a masterpiece like some people insist. All the characters are rather unlikeable and quite frankly, Ava Gardner’s acting is well below par. It’s like watching a bad daytime soap in places. But it isn’t a turkey either, as it shows spying as a rather un-attractive business, and Bogarde, and Dalton’s performances are very good. Dalton in an early role, steals the show with his snarly intensity. I’ll give you a very quick overview of the plot, and the characters that make up this labyrinthine tale of cross and double cross. It seems that many years ago, Alexander Diakim (Bekim Fehmiu) was a freedom fighter in a country ruled by fascists (Which country? They don’t say.) But during the struggle, Diakim was forced to flee the country and go into hiding. Here it is nine years later, and he is preparing to return home, and instigate and lead a revolution. The first character we meet is Alan Curtis (Dirk Bogarde). He is an operative for the Western Intelligence Liasion. W.I.L. don’t want Diakim to go back at this time, and in an attempt to dissuade him, they put together an operation that will change his mind. But for the scheme to work, they need the co-operation of five people. The first person in Melissa Lascade (Nicole Calfan). She too is a revolutionary, but not for any particular cause. She is motivated by money. And while she is very attractive, she is also a killer – an expert with firearms. The second person is Scott Elliot Allison (Frederick Forrest). Allison is an idealistic journalist, and happened to be involved in Diakim’s revolution years ago. In fact Diakim saved Allison’s life. Next on the list is Francois Diderot. Francois is an eight year old boy who lives in France with his adoptive parents. The fourth person is Charles Lord (Timothy Dalton). Lord works in the finance section of the Foreign Office, and in the past, the Office had provided a fighting fund for Diakim. A loan that Diakim has been unable to repay. And the final recruit is Katina Petersen (Ava Gardner). She once had a relationship with Diakim. Curtis has bullied, manipulated, blackmailed, and lied to all of these people to get them to co-operate. But whatever his methods, he manages to get them all assembled in a small village in Austria. Of course, they are all unaware that other people are involved and are billeted out to various hotels, and chalets. Here is where the story gets a little complicated and a whole lot deceptive. Allison has the first attempt to dissuade Diakim. And Allison is doing it from the heart. He arranges a meeting and talks to Diakim in person. He tells Diakim why he should wait until the West will support his return. Unfortunately the message falls upon death ears, because Curtis has been telling Diakim’s people that Curtis works for the C.I.A. Now hang on. It’s Curtis’ plan that Diakim shouldn’t go back. Why should he sabotage it by spreading false rumours about Allison? Ah, that would be telling! Next we have Katina. It is now her turn to convince Diakim not to go. But she starts to get a little edgy, and doesn’t want anything to do with Curtis. Then Curtis, drags out Francois Diderot. Yep, the little boy. It seems that Katina is his mother and she gave him up for adoption when he was born. And adding to the level of convolution – guess who the father is? You got it, Diakim. And where does Charles Lord fit into the picture? As I mentioned earlier, that he works for the Finance section of the Foreign Office. A section that had lent Diakim money. It is Lord’s job to pretend to be collecting the debt. And, or offering a bribe that he should stay. Of course, Diakim is too proud to accept the bribe, but that leads us into another plot strand that I won’t go into here. As you can see, each of the characters has their own backstory and each of the character’s fates is intrinsically tied to the fate of Alexander Diakim. The story almost works, but the sheer level of twists and turns negate the clever aspects of the story. 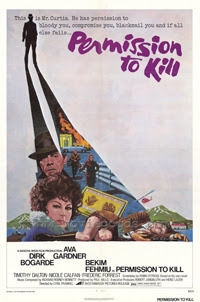 As I said at the outset, Permission To Kill is not a masterpiece but it is a reasonable spy thriller, and made in the same vein that so many of the early seventies spy films where. Gone were the glamorous days of the sixties, and in their place were gritty realistic spy stories, that had unpleasant people doing dirty little jobs. On that level, Permission To Kill may be one of the more successful attempts at showing that side of the game. But compared to a contemporary film, like The Bourne Identity (the Damon version), which also shows spying as a dirty business, younger audiences could find Permission To Kill to be rather cold, and in places, boring. Cool post as for me. It would be great to read something more concerning that theme. The only thing I would like to see here is some pictures of some gadgets.